The Spartan is an inside the waistband (IWB) leather and Kydex hybrid holster for concealed carry. Designed to be worn behind the hip at 4:00 or 5:00, the Spartan is a more economical version of the Minotaur MTAC that provides comfortable concealed carry at a lower price. The Spartan’s leather backing is the most comfortable material holsters can be made of. It provides a soft flexible material that when placed against the body does not rub or pinch. The Spartan backing is is only a single layer of leather which allows the hardware to show and be felt on the backside. Since there is nothing on the rear side of the hardware you may need to add moleskin to keep the hardware from pinching or rubbing your skin. The Kydex body on the Spartan provides a rigid material that is fit to each firearm and maintains its shape even with the pistol un-holstered. The smooth low friction surface allows for a fast draw and easy one-handed re-holstering of the firearm. The all-Kydex body will not bend or stretch over time and is impervious to sweat and solvents. 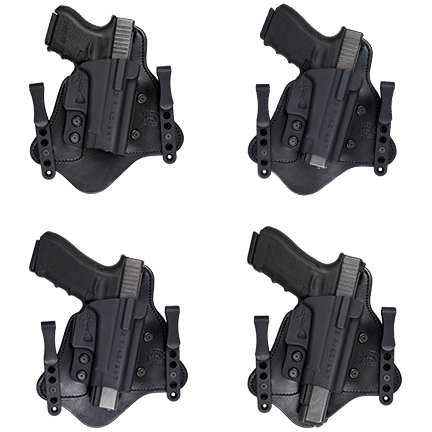 The Spartan’s Kydex body is also interchangeable allowing you to have one holster for all of your firearms. The Spartan attaches to the belt by two clips mounted to the leather tabs on either side of the holster. These mounting clips distribute the weight of the loaded pistol while holding securely to the belt. A shirt may be tucked in over the gun and holster providing complete concealment. The clips will also allow for ride depth or cant adjustment by using the different mounting holes. The Spartan can be purchased with either 1.5” Black Standard Clips or 1.5” Black C-Clips. To purchase other clips styles, sizes or colors, please visit our Holster Parts and Hardware or the clip pages below. Additional clips are only $4.99 a piece. Returns and Exchanges: Due to the cosmetic vulnerability of leather, Comp-Tac reserves the right to charge a 20% restocking fee on any leather returns or exchanges that are deemed to be damaged or abused. One of the BEST you can buy! Daily carry for 2 years with HK45. Outstanding craftsmanship! Holster is very comfortable, fits great, I can run and jump and the gun stays secure. Just bought another one for my VP9. For being the economical version this is a great holster, much better then other manufacturers who I have tried. I bought this holster for my Glock 19 about 2 years ago. It is confortable, stable and a perfect fit. Now I need a holster for a Glock 43 and I can't think of a better holster for the money. Great value. Im very impressed with this holster, so much in fact i bought a second one for my 1911. Very well made, and comfortable year round. I normally don't say much about products due to the fact many things dont impress me that much, but i will and have recommended this to friends who are looking for a good IWB holster. Purchased one of these for a 1911 a couple of years ago. Getting another for carry a CZ 75B. Comfortable and secure. Quality product at a good price. I bought this holster for my Glock 19 and 43, best fit, more comfortable, great concealability. Other hybrids are too wide and stick out to the sides where the screws are so the holster can't bend around the waist (especially if you have a small waist). The Spartan is narrower so it can be worn at 3 o'clock as well as any other positions with no problem. It is the best hybrid for the money.